Only the highest quality Montmorency cherries are used to produce this product. These cherries are from the lighter coloured amarelle prunus cerasus variety and have a tart flavour. This great tasting juice is naturally preserved to help maintain the integrity of the product. The rich nutritious content of the Montmorency Cherry means this fruit is associated with the term Super Food. Contains no powders, artifical flavourings, colours and no added sugar or sweeteners. 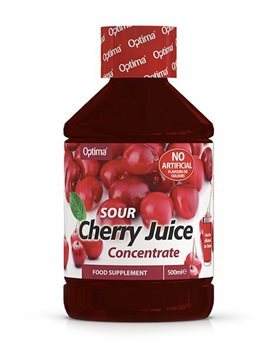 Montmorency Cherry Juice Concentrate (99.8%. Preservative: Potassium Sorbate. A 30ml serving is recommended and can be mixed to smoothies, yoghurts or sports recovery drinks. Great product which assisted in eliminating a bout of gout. The taste is pleasant and very gentle on the stomach. I have tried other brands claiming the same, how so ever the have irritated my stomach. I believe that I have gained great health benefits from this product and recommend it as a product of quality that delivers as proposed. Lastly I actually enjoyed the flavor a great deal!